Affidea, Europe’s leading diagnostic imaging provider, has announced additional investment in the Irish health system with the introduction of Affidea ExpressCare to Dublin, following the success of the first ExpressCare Clinic in The Elysian in Cork. Affidea ExpressCare provides high quality treatment for patients with minor injuries and illnesses; offering an alternative to a traditional, highly pressurised hospital setting. Affidea ExpressCare will open at Tallaght Cross East in June, adjacent to Affidea’s flagship multi-modality scanning centre that offers X-rays, MRI, Ultrasound and CT scans. The state-of-the-art ExpressCare facilities provide access to outstanding healthcare, without an appointment, from 10am to 10pm, 365 days per year. Affidea ExpressCare is committed to providing an efficient service, including seeing patients within a one-hour turnaround time, and children over one-year of age can attend. Tommy Drumm, MD of Collen Construction, said; “We are delighted to have successfully completed another new state of the art Medical Scanning Centre for our esteemed Client Affidea”. 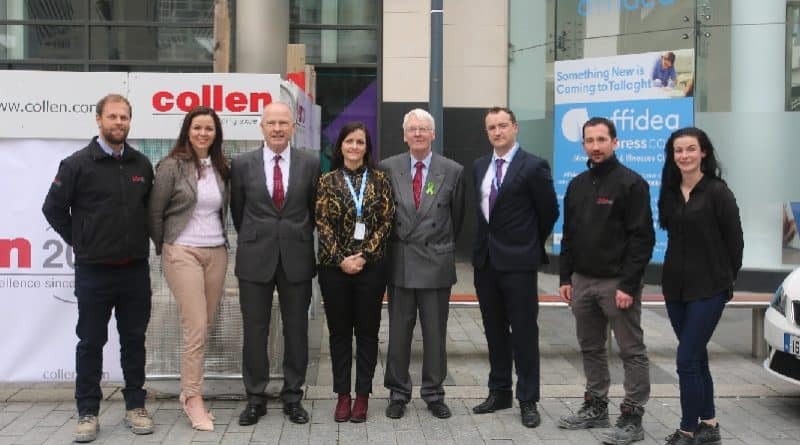 “The recently completed project in Tallaght follows our successful completion of a Minor Injuries Unit in the Elysian Tower in Cork, installation of two new MRI machines in Dundrum and installation of a new MRI machine in Northwood. These projects follow on from our initial involvement with Affidea as Design Build Contractor on the refurbishment of the Dundrum Medical Diagnostics facility, officially opened by then Taoiseach Enda Kenny in 2016. Our continued ability to meet our Clients requirements to deliver high-tech, high quality projects, within tight programme parameters and to the highest safety and environmental standards, has ensured our continued relationship with Affidea, as our 6th project (a new Minor Injuries Unit adjacent to the recently completed Tallaght Scan Centre), progresses onsite. We commend Affidea on their implementation of this important investment plan for the Irish Healthcare Sector and look forward to continued success together on future projects” Drumm concluded. ExpressCare operates independently, as is the case with Affidea Diagnostics, providing services to all patients who attend on a fee-for-service basis or, alternatively for patients with Private Health Insurance with Laya Healthcare and Irish Life Health, Affidea ExpressCare is a covered benefit. Affidea is the leading Pan-European provider of diagnostic imaging and outpatient care services, with 235 centres operating in 16 countries across Europe; focusing on delivering timely, thorough diagnoses and high-quality treatments by working only with state-of-the-art technology and the best medical professionals. The Affidea Group works with 7,700 professionals and operates over 1,200 diagnosis and cancer care equipment, with more than 10 million diagnostic examinations every year.